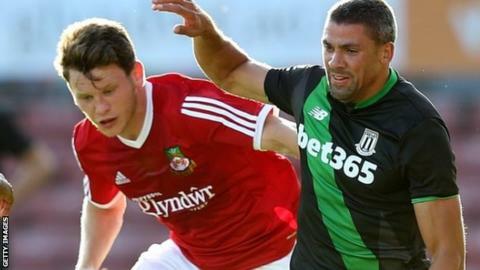 Wrexham came from behind to secure their first win in five National League games and extend Lincoln City's winless run to 10 games. Paul Farman denied James Gray before Wes York equalised with a glancing header from Connor Jennings' cross. Jennings and Simon Heslop's second half goals secured Wrexham's first win of 2016. Captain Jennings put the Dragons in front early in the second half after Farman could only parry Dominic Vose's cross. Man of the match Taylor twice denied Muldoon before Heslop scored his first Wrexham goal with a late 25-yard strike. Wrexham had lost their previous four league games as well as defeat at Torquay United in the FA Trophy the previous Saturday. Gary Mills' side are 10th in the table and six points off the play-off places. Lincoln, who have not won in the National League since a 3-1 victory at Torquay on 21 November, are down to 11th. Wrexham manager Gary Mills told BBC Radio Wales: "We all needed that and what a difference three points make. "The lads have gone over that white line to win today. You could see that. "It's great to get three points and we go into two important away games on the back of a win." Match ends, Wrexham 3, Lincoln City 1. Second Half ends, Wrexham 3, Lincoln City 1. Substitution, Wrexham. Adriano Moke replaces James Gray. Goal! Wrexham 3, Lincoln City 1. Simon Heslop (Wrexham) left footed shot from outside the box to the bottom left corner. Assisted by Sean Newton. Attempt missed. James Gray (Wrexham) right footed shot from the right side of the box misses to the right. Attempt saved. Jack Muldoon (Lincoln City) right footed shot from the left side of the box is saved. Foul by Wes York (Wrexham). Paul Farman (Lincoln City) wins a free kick. Attempt missed. James Gray (Wrexham) left footed shot from the left side of the box misses to the right. Craig Stanley (Lincoln City) is shown the yellow card for a bad foul. Rob Evans (Wrexham) wins a free kick. Attempt missed. Rob Evans (Wrexham) right footed shot from outside the box misses to the left. Attempt missed. Sean Newton (Wrexham) left footed shot from outside the box is too high. Assisted by Kayden Jackson from a direct free kick. Foul by Patrick Brough (Lincoln City). Foul by Manny Smith (Wrexham). Robbie McDaid (Lincoln City) wins a free kick.